SEOUL, Nov. 19 (Yonhap) -- The best home run hitter in South Korean baseball was crowned the league's top player on Monday. Kim Jae-hwan of the Doosan Bears earned the MVP award of the 2018 Korea Baseball Organization (KBO) regular season. The slugging outfielder collected 487 points out of a possible 888 points in a media vote. The players earned points for top-five votes: a first-place vote was worth eight points, followed by four points for a second-place vote, and so forth. Kim's Doosan teammate, right-hander Josh Lindblom, finished second with 367 points, followed by Park Byung-ho of the Nexen Heroes with 262 points. Kim earned 51 first-place votes, with Lindblom earning 18. Another Doosan player, catcher Yang Eui-ji, had 13 first-place votes, one more than Park Byung-ho, but Yang finished fourth overall with 254 points. In his eighth season, Kim played in 139 games and led all players with 44 home runs and 133 RBIs -- both career highs. The 30-year-old also led the KBO with 346 total bases while ranking second in slugging percentage with .657 and on-base-plus-slugging (OPS) with 1.062. Kim batted .334 and scored 104 runs, becoming the first KBO player to post at least a .300 batting average, 30 homers, 100 RBIs and 100 runs scored in three consecutive seasons. Kim put up these gaudy numbers despite playing his home games at Jamsil Stadium in Seoul, the biggest and least hitter-friendly ballpark in the KBO. After Park Byung-ho of the Nexen Heroes won back-to-back MVPs in 2012 and 2013, the KBO has now seen five different MVPs in five seasons. Kim is the sixth Bear to win an MVP award and the third position player from the franchise after Kim Sang-ho in 1995 and Tyrone Woods in 1998. All three players won the home run titles in their MVP seasons. 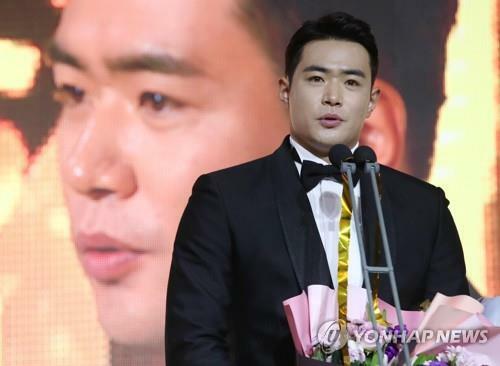 "I can't think of anything to say, other than to thank everyone," Kim said after receiving his award at a ceremony in Seoul. "I know the best way to repay my fans for their support is to keep doing the absolute best I can on and off the field." Behind Kim's slugging ways, the Bears finished in first place in the regular season with a record-tying 93 wins against 51 losses. Kim was drafted out of high school as a catcher in 2008 but converted to first base before moving to the outfield. Until 2015, he was a fringe player who spent more time in the minors than the bigs. Kim finally broke through with 37 homers and 124 RBIs in 2016, and followed that up with 35 home runs and 115 RBIs in 2017, while batting a career-best .340. The MVP award this year is a culmination of a career arc that included a failed doping test in 2011. He tested positive for a banned substance before the Baseball World Cup that year and was suspended for 10 games in the 2012 season.